The teaching will include a webinar, open to anyone, on Tuesday evening, September 25, at 7:30 p.m. EDT. “A Conversation about the Gospel of Jesus’ Wife” will be an informal presentation about the papyrus fragment that was newly unveiled this week by Professor Karen L. King of Harvard Divinity School at a Coptic Congress in Rome. To register for the webinar, click here. The papyrus fragment is tiny, just eight lines in front and six lines in back. The fragment includes the words “Jesus said to them, ‘My wife….” and also indicates this woman would become a disciple. The text raises many questions about what early Christians believed about Jesus and his relationship with a woman named Mariam. 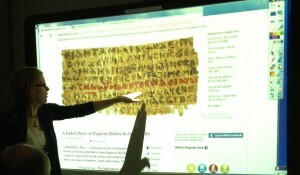 “The fragment is intriguing both for what it says and for what it does not say,” notes Prof. Good. She has written an article for Episcopal Café that offers a translation of the recto of the fragmentary Coptic text, line by line, in English. The article also offers scholarly commentary on the text and a description of the academic setting for Prof. King’s announcement of the discovery. Early evidence indicates the fragment is genuine and not a forgery. The class will spend the next weeks translating and commentating on the fragment. “We still don’t know which venue we’ll pursue for sharing our work, but we will definitely share it once it’s done,” she said. Professor Shaner has prepared a FAQ about the fragment. Download it here.